You can read dozens of books on what to expect with your first child, but when that time finally comes, everything you thought you knew may go out the window. Maybe you had certain routines and expectations for putting Baby to sleep, but those didn’t work. And that’s okay. 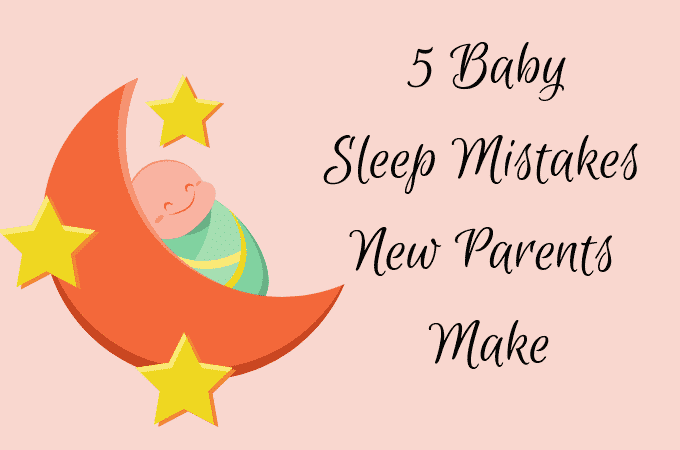 New parents often make these mistakes when it comes to baby sleep. We’re here to help you work through it so you and Baby can get a good night’s rest. Newborns typically sleep most of the day during the first few weeks of their life. Even at 3 to 4 months, they’ll still sleep at least half the day. Since they sleep so much, new parents can be lulled into thinking that they’ll sleep through the entire night. But they won’t. Newborns haven’t developed a sleeping pattern similar to adults yet, where their longest period of sleep is throughout the night. They can and will wake up at any time. Parents must remember to be patient. We know that it can be frustrating being awoken in the middle of the night. Just know that your baby is growing and developing rapidly, and eventually, they’ll settle into a more regular sleep schedule. After your baby has started developing a sleeping pattern, they may be sleeping mostly during the night and taking naps during the day. Babies around 12 months often take afternoon naps that last 1 to 2 hours. Some parents might be tempted to cut afternoon naps short, afraid that their baby won’t sleep through the night if their nap is too long. But cutting a nap short might disrupt their sleep cycle, which varies depending on their age and stage of development. While adult sleep cycles last about 90 to 120 minutes, baby sleep cycles are around 50 minutes during their first 9 months. Waking your baby early from a nap can disrupt the development of a healthy sleep cycle. Also, remember that length of naps will vary. On some days your baby will nap more and other days, they’ll nap less. Allow your baby to get as much sleep as they need. You may be tempted to keep it as quiet as possible when your baby is taking a nap. You and your spouse might tiptoe around the house, watch TV on mute, or curse the family dog for barking. This is understandable–you want your baby’s naps to last–but ultimately it won’t help your baby’s sleep habits. By making regular noises while baby is sleeping, such as fixing a meal or cleaning the house, your baby will learn to sleep through them. If you insist on being silent during your baby’s naps, you’ll tire yourself out from the effort, and your baby will learn to depend on absolute quiet in order to fall asleep. Creating a bedtime routine is one of the most helpful natural sleep aids you can use. Bedtime routines usually include entering the sleep space, dressing in pajamas, a bedtime story, and gentle motions like rocking to sleep. This soothing routine helps your baby relax and prepare for sleep. By skipping a bedtime routine, you’re asking your baby to go from bright-eyed and awake to sleep in a matter of minutes. It is ideal to give the last feed and cuddles with the lights off. Putting Your baby to bed half awake does not help them actually learn how to go to sleep on their own. This is a concept they will not learn until they are older. Remember that adults have bedtime routines: taking a warm shower or washing your face, brushing your teeth, then reading in bed before falling asleep. Babies need a routine to wind down, too. There are several sleep training methods out there that include guidelines for soothing a fussy baby back to sleep. Every family is different; certain methods work well for some parents and others don’t. Whether it’s the Ferber method, Baby Created Sleep method by Rachelle, shush-pat or extinction method, make sure you and your spouse are on the same page. Agree on what tactic to use when getting your baby to sleep, consoling baby when they wake at night, and how to soothe him or her back to sleep. Little differences such as rocking baby to sleep in a chair versus gentle motion while standing is okay, but routines in general should be the same. Being consistent will help your baby develop healthy sleep patterns and sleep habits. If you need more advice on baby sleep, talk to us. Our sleep training professionals help create a sleep training method that will meet you and your baby’s needs.